The 800m qualifying rounds were a bit unpredictable as a number of favorites did not advance to the semifinals as their spots were filled by some pleasant surprises. 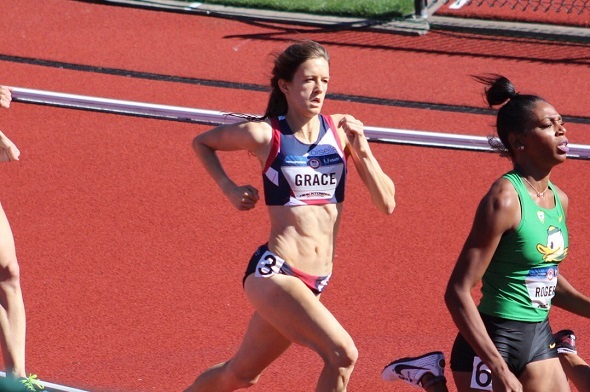 Fortunately, Kate Grace (Yale ’11) – who is a favorite in both the 800m and 1,500m to make the team – was able to advance to the semifinals. In the final qualifying heat, she was in the middle of the pack at the 400m mark and maintained her position through 600m. In the final 200m, she showed off her speed and grabbed the heat win in a speedy 2:01.36. Her time was the eighth fastest among all of the qualifiers. One of the “pleasant surprises” was recent Princeton graduate Cecilia Barowski. In the fourth heat of the night, Barowski moved was among the heat leaders throughout the first 600m of the race by holding onto third place. In the final 200m, she used her signature kick to grab an automatic berth to the semifinals by finishing second in 2:03.29. Barowski was one of five collegians who advanced to the semifinals. Megan Krumpoch (Dartmouth ’14) was in the same heat as Barowski, but did not have enough room to catch up as she finished in fourth place in 2:05.35, outside of semifinal qualification. But someone else from Dartmouth managed to make it to her respective final. Kaitlin Whitehorn (Dartmouth ’16) was the sixth best high jumper in qualification as she cleared 6-feet for the first time during the outdoor season (1.84m or 6-00 1/2). Top 12 advance to the finals. Whitehorn was the top collegian to advance to the high jump finals. Princeton alumna Jasmine Blocker (Princeton ’15) was the final HepsNation female to compete on Day 1. She finished 27th overall in the 400m qualifying round, running 54.54. This entry was posted on Friday, July 1st, 2016 at 8:25 pm. It is filed under Olympics, Spotlight. You can follow any responses to this entry through the RSS 2.0 feed.